SACRAMENTO, California, October 2, 2014 (ENS) – California Governor Jerry Brown on Tuesday signed the nation’s first statewide ban on single-use plastic shopping bags. Hawaii has had a de facto statewide ban for nearly two years, but because each of the four major islands is a county, the bag bans were approved county by county. 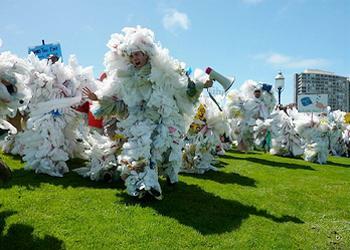 Senate Bill 270 will phase out single-use plastic bags across the entire state of California. The measure takes effect on January 1, 2015 in grocery stores and pharmacies. Beginning July 1, 2016, convenience stores and liquor stores will no longer be able to hand out single-use plastic bags. Plastic bags cause litter, slow sorting and jam machinery at recycling centers. 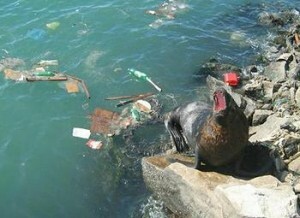 They kill birds, turtles and marine mammals that become entangled or mistake the bags for food. Plastic composes 90 percent of all floating debris worldwide. The combined cost of single-use plastic bags to California consumers and state and local government for use, clean-up and disposal is estimated to be in the tens of millions of dollars annually. The plastic bag ban bill was jointly authored by Senators Kevin de Leon of Los Angeles, Ricardo Lara of Huntington Park/Long Beach, and Alex Padilla of Pacoima – all Democrats. It provides for up to $2 million in competitive grants for bag manufacturers to retool and retrain to meet the new situation. Senator Padilla says the drive for statewide legislation comes from the many California cities and counties that already have bag bans. Ninety-eight local governments throughout the state have already adopted plastic bag ban laws covering more than 127 cities and counties, including the state’s two largest cities – Los Angeles and San Francisco. 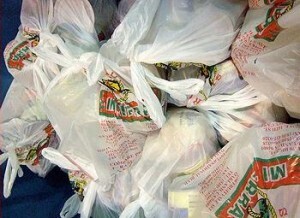 Plastic bag manufacturers said they would go to the voters over the issue, asking for a referendum. Padilla said Californians would reject a referendum effort and adapt to living without plastic shopping bags to help the environment. “Single-use plastic bags litter our beaches, our mountains, deserts, rivers, streams and lakes. SB 270 addresses this problem while striking the right balance. It protects the environment as well as California jobs as we transition to reusable bags and a greener economy,” said Senator Alex Padilla. Senator Lara said the measure really is a boon to bag manufacturers. “This bill protects our environment by reducing plastic in our waste stream, and provides resources for California bag manufacturers to retrain their workers and re-engineer their operations to make plastic bags meet new, environmentally sound criteria. It’s a win for the environment, a win for manufacturers and a win for jobs,” said Lara. “Nothing we use for a few minutes should pollute our environment for hundreds of years,” said Nathan Weaver, Oceans Advocate with Environment California. “SB 270 is an important step forward to keep single-use plastic bags off our streets and out of our waterways. Each year, more than 13 billion single-use plastic bags are given out by retailers. According to CalRecycle, a state government agency, just three percent are actually recycled in California. The National Conference of State Legislatures shows that Massachusetts, New Jersey, Rhode Island and Puerto Rico also have bills going through the legislative process that would ban single-use plastic bags.